We like charts. But since most of the excitement (and intrigue) has been on the GOP side, we haven’t had a chart to play with on the Dem side. Now we do, thanks to Nate Silver, of FiveThirtyEight. Silver says, “It’s Really Hard To Get Bernie Sanders 988 More Delegates,” but it’s not impossible. OK, so it’s not likely. . .but it’s possible. And here’s the chart to follow. 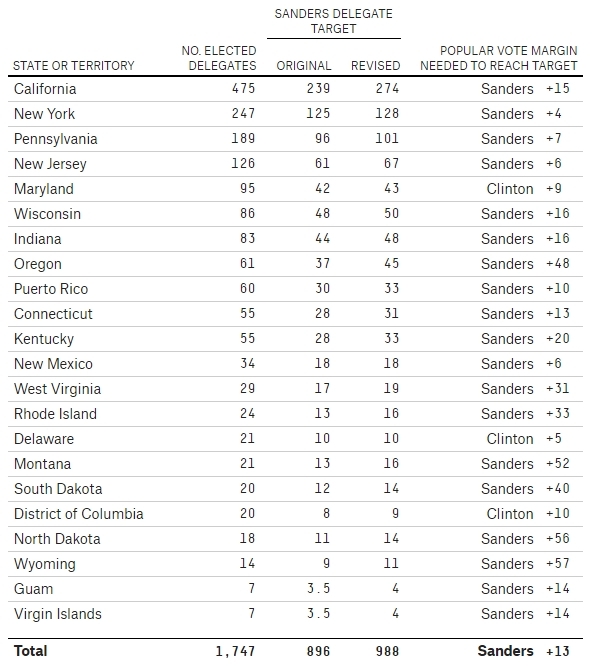 It’s important to note that the chart was done before Wisconsin—and Bernie got exactly what he needed there. Silver admits that this chart is pretty much wishful thinking, but at least we have something to follow, to see how well, or how badly, Bernie does. The good news for Sanders is that this scenario would represent such a massive sea-change that superdelegates really might have to reconsider their positions. You might even say it would require a revolution, a profound rejection of Clinton and the status quo. “Here is our path to the nomination. First of all, we have extraordinary momentum. We have won six out of the last seven caucuses and primaries. We’ll see what happens today in Wisconsin. We’ll see what happens shortly in Wyoming. And we have won all of those elections up to now by landslide victories.. . . This path, however, is a difficult row to hoe. Even liberal MSNBC thinks so. The entire Sanders plan hinges on winning New York. If Sen. Sanders doesn’t win in New York, then Pennsylvania, and New Jersey, he will not only be impossibly behind in pledged delegates, but he will also lose the argument that he is the candidate who deserves to be the Democratic nominee. After Wisconsin, there are no more open primaries and caucuses until May 3. As noted, Bernie’s path assumes he’ll win New York. Nate Silver concedes it’s a problem. I assumed Sanders would narrowly win New York, for instance, even though he’s trailed Clinton by margins ranging from 21 to 48 percentage points in recent polls there. Previous articleWisconsin: Turning Point or Trojan Horse? If Bernie takes off the gloves, he’ll win most of the remaining states, and eventually get the nomination. All he has to do is start pounding that Hillary has been informed that the FBI will bring her in for questioning (the FBI has already contacted Hillary’s lawyers, and many of her underlings’ to that effect — that they ALL will be questioned by the FBI). Anyone being investigated by the FBI, IG and DOJ should automatically be disqualified to run for any office, let alone the Presidency! End of story. Bernie says he doesn’t want to run a negative campaign — but, telling the truth is not negative, it is a DUTY to do so! Could someone help me understand why only 51 out of 118 delegates in Washington state have been allocated? It takes time to figure some of the arcane ways delegates are awarded. The official number, according to Google, is only 25-9. However, the New York Times as estimated the final outcome at 74-27. I want to know when it’s enough…..when either Sanders or Clinton throws in the towel to support the party and not their individual desires. I’ve not heard Clinton say she’s going all the way to the end but I keep hearing Sanders will whether or not he has the numbers. I’m not taking a political side so don’t get jacked up….but what’s right for the party? What would be the magical number?